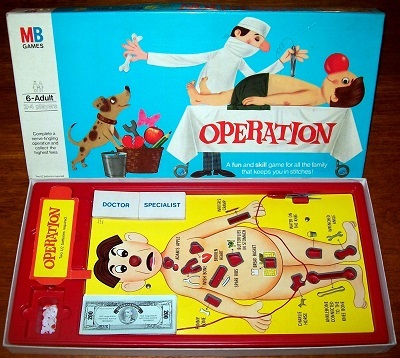 'OPERATION' GAME: A fun and skill game for all the gamily that keeps you in stitches! Complete a nerve-tingling operation and collect the highest fees. The game is complete and in excellent condition throughout. The box is clean, solid and sturdy and every corner is fully intact without any use of sellotape. The money is crisp and clean and the 24 operation cards are in good condition. The cardboard game surface with its picture of your nervous-looking patient is practically flawless and the 12 body parts are immaculate. And most importantly the electronic circuit, tweezers, buzzer and red lightbulb are all in perfect working order.